Rare even by European Carnival standards, this elegant pattern was made by the Swedish glass manufacturer, Eda. Report shapes are flared out bowls, straight up bowls, and this rosebowl shape. This 8-inch blue rosebowl (with pinheads) sold at a 2001 auction for $70. A marigold example, also 8 inches (and also with pinheads) brought the same price as the same auction. 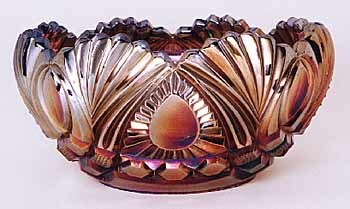 In 2007, a marigold rosebowl brought $25.